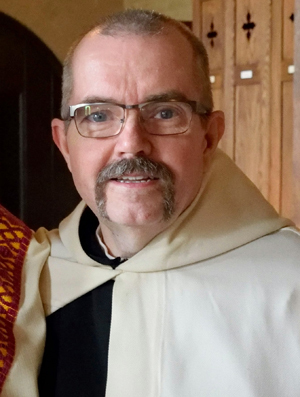 On Saturday, May 9 the monastic community gathered with the friends, family and guests of our Brother Stephen Shanahan to celebrate his Solemn Profession. It was a day of great joy for us all. The Gospel Brother Stephen chose for the Mass was from Mark 10. 46-52, the story of the blind Bartimaeus. The cry of Bartimaeus to Jesus, “Son of David, have pity on me” echoed Stephen’s desire that the mercy of the Lord surround and sustain him always. May Brother Stephen ever be a monk after Christ’s own Heart and taste always how good the Lord is.